Let's dedicate this Sunday to Catan! A good command of German is needed as the game is in German. I will bring several extensions: Städte und Ritter, Seefahrer and Händler und Barbaren. Basisspiel geht auch. 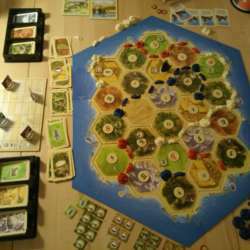 Catan is a great strategy board game, the aim of which is to be the first to reach a certain amount of points by expanding your colony on the Catan island. The restaurant is located between Protected content It closes at midnight.